The Provost and Senior Vice President for Academic Affairs and Student Success is the College's chief academic officer, and reports directly to Dr. José Luis Cruz, the president of Lehman College. The provost provides the vision and leadership to build on the strengths of the College, and contributes to the advancement of the College’s strategic plan, which advocates for excellence in teaching, research and learning; enhanced student success; institutional effectiveness; and a commitment to engagement and community service. The provost oversees all educational programs, faculty matters, accreditation reviews, strategic planning, and school and departmental budgets. The Office of the Provost and Senior Vice President for Academic Affairs and Student Success is the hub of Lehman’s academic programs and many administrative operations, with a mission to ensure the success of students, faculty, professional staff, and the College in a welcoming, efficient, and effective manner. Day-to-day, the office strives to affirm and advance the College’s core institutional values: access to education; academic and scholarly excellence; life-long learning; commitment to social justice; and service in the public interest through collaborations with P-12 schools, and community, business, and industrial partners in the Bronx, throughout the region, and beyond. 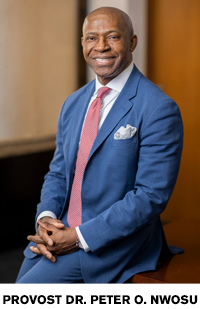 Dr. Peter Nwosu became provost and senior vice president of academic affairs and student success at Lehman College of The City University of New York, effective spring 2019. He has broad responsibilities for advancing excellence in faculty teaching, research and scholarship, improving student success outcomes (access, learning, retention, graduation, and post-graduate experiences), and achieving greater academic and institutional effectiveness at the college. His portfolio includes five academic schools; student affairs; enrollment management; library; research and sponsored programs; and international programs and global partnerships, among others. An American Council on Education Fellow and Fulbright Scholar, Dr. Nwosu is a nationally recognized academic leader whose impactful experience includes the collaborative design, development, and implementation of initiatives ranging from curricular modernization and innovation, to guiding faculty and staff development, expanding opportunities for faculty and student research and creative activities, aligning academic and student life, fostering strategic partnerships, and improving student success outcomes. Prior to his appointment at Lehman, Dr. Nwosu served as provost and vice president for Academic Affairs at Clark Atlanta University (CAU), an HBCU that has been ranked as the leader in economic mobility among Atlanta-area colleges and universities. At CAU, he led strategic and operational initiatives for the divisions of Academic Affairs and Student Affairs, a portfolio that includes four academic schools; planning, assessment, and institutional research; institutional accreditation; strategic planning; enrollment services; student services and campus life; research and development; center for undergraduate research and creative activity; university honors and scholars’ program, and career development center, among others. Before his appointment to CSUF, Dr. Nwosu was associate vice president for Academic Affairs, Institutional Planning and Assessment at Tennessee State University (TSU) in Nashville, where he led the development of a campus-wide assessment program, the implementation of the university’s strategic plan, the creation of new degree programs, and the coordination of a successful institutional reaccreditation process. Author of three books and more than 90 scholarly writings including refereed journal papers, training manuals, and conference presentations, Dr. Nwosu is a recognized expert in intercultural and international communication, diversity training, strategic planning, assessment, program evaluation and educational effectiveness. Dr. Nwosu currently serves on the Executive Board of the American Council on Education Fellows Program, the Board of Directors of the California Urban Partnership, and the Board of Directors of the national Association of Chief Academic Officers. Dr. Nwosu earned a Ph.D. in communications studies from Howard University in Washington, D.C., and is also a graduate of the Institute of Higher Education at Harvard University.